We’ve already learned that the Houston Astros are going back to some sort of orange and blue shooting star combination for next season, only modernized, when they move into the American League West division. The Mets have unveiled the first All Star Game patch minus any team or city reference since the 2005 game for next summer’s game in Flushing, and now, the Colorado Rockies have unveiled their 20th anniversary logo for next season which will be worn as a jersey patch (pictured above). For the Rockies, it’s their fourth anniversary/commemorative patch in team history, joining the patch they wore in their inaugural season of 1993, the first season of play at Coors Field in 1995, the 1998 All Star game patch, and the 10th anniversary patch of 2003. It’s likely the Marlins will join Colorado with a 20th anniversary patch as well. Authentic Store Buzz: They’re here! Nike Elite authentic jerseys for the Eagles, both the green jersey and the alternate black jersey in Michael Vick’s number 7 (pictured above left to right). We’re closing in on two events coming up: Left Field Cards presentation with artist Amelie Mancini on Thursday, October 4 from 6-8pm at our Center City Philly location (137 S. 13th Street). The event will mark the official unveiling of Amalie’s “Presidents of the United State of Baseball” letterpress baseball cards. Then on Saturday Oct. 6, is the annual Midtown Village Fall Festival in which 13th Street in front of the store is closed to traffic and it’s one giant block party throughout the area in which merchants set up out in front of the stores. We invite you stop by for the day-long event (noon-8pm), they’ll be all sorts of the special proceedings going on in and around the store. Authentically Speaking Trivia Time: What season did the Cincinnati Reds add the player’s name to the back of the uniform? Answer coming on Wednesday. 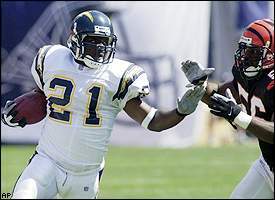 Monday’s answer: Before staging a whiteout at Qualcomm Stadium Sunday against Tennessee, the Chargers last wore white jerseys with white pants at home in 2001 against the Bengals in week three of the season.